Adiposity is the most important risk factor for the development of insulin resistance and type 2 diabetes mellitus. In addition, it is also possible to reduce the amount of insulin in the body. Adipose tissue is an important endocrine organ. It is involved in the regulation of energy metabolism by secreting factors (adipokines) that regulates appetite, food intake, glucose, and energy expenditure. Many of these adipokines display profound day / night rhythms, and accumulating evidence links disruption of these rhythms to metabolic diseases as well as obesity and type 2 diabetes. In the case of a neurological disorder of the brain, there is a difference between the brain and the brain, and the hypothalamus of the brain WAT functions. The present proposal is based on the assumption that the WAT is circadian, metabolic and endocrine functions. 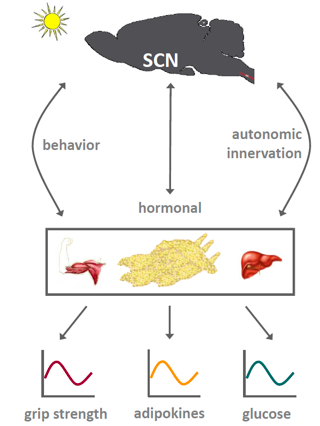 Three pathways via which the SCN could relay timing information to peripheral tissues.